Integral Blinds should be there but not seen…they should be seen through! 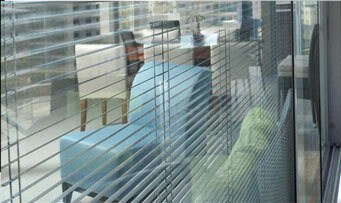 Sunshade Blind System’s products are so practical and innovative everyone in the business thinks they are fantastic. The saying that “Integral Blinds should be there but not seen” is really true, which is why they are blinds inside sealed units. The slats are less than 0.9mm thick and have only the slightest curve, the Sunshade range represents the lowest profile integral blind system available anywhere. With the slats fully lowered and adjusted to horizontal the blinds are so discrete and are so low profile that they become barely visible as the eye focuses beyond them to the view outside. This is why so many people buy our Sunshade Blind Systems products… because like us they believe that integral blinds should be there but not seen – they should be seen through! But when they are closed they provide privacy and as well as providing a quiet working or living environment. As well as being discrete, integral blinds look sleek, provide a stylish solution and are safe to use. They are long lasting, often outliving normal venetian blinds by some years. This is because the actual blinds are not exposed to the air and are not subject to wear due to usage. If this idea excites or interests you, why not give us a call on 0800 310 12 22 and find out how Sunshade Blinds can improve your office or home.